Separatists in Kashmir today termed the NIA's summoning of Hurriyat Conference chairman Syed Ali Shah Geelani's son an "act of vengeance and harassment". 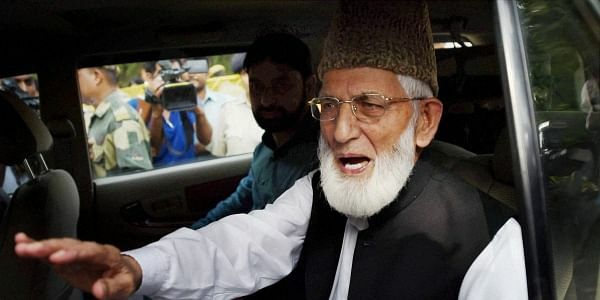 SRINAGAR: Separatists in Kashmir today termed the NIA's summoning of Hurriyat Conference chairman Syed Ali Shah Geelani's son an "act of vengeance and harassment". The National Investigation Agency (NIA) had on Friday summoned Naseem-ul-Zafar Geelani to its headquarters in New Delhi in connection with a terror funding case. The separatists, under the banner of Joint Resistance Leadership (JRL), alleged the central government, "using the NIA and the ED, has time and again summoned hundreds of others including both sons of Geelani to Delhi several times, wasting their precious time, intimidating and humiliating them". "Summoning Syed Naseem Geelani to Delhi is an act of vengeance and harassment. Forcing one for talks by bullying is ridiculous," the separatists said. The JRL targeted the Centre's special representative for Kashmir Dineshwar Sharma and said, "It now wants us to talk to its envoy by intimidating us and this summoning of kith and kin by the NIA is an example of this forced talks policy."